In the digital age, how does a business engage people offline in a meaningful way – especially at a time when attention spans are shorter, and your customers are probably multitasking with their mobile phones while they spend time with you? This is a question that vexes businesses ranging from retail to entertainment. If you are one of those businesses, consider how museums are adapting to digital. Museums all around the world have struggled with attracting visitors and creating that draw for locals and tourists to visit famed halls for masterpieces of yesterday. Recently, a new genre of “experience” exhibits (cross between a museum, amusement park, and a retail location) has emerged. 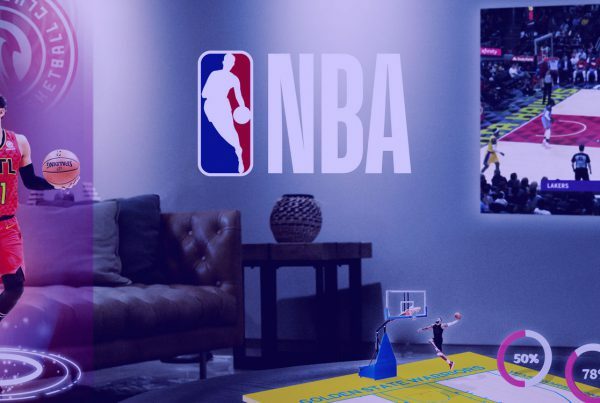 At these exhibits, visitors are encouraged to interact with immersive content and ultimately choose to share their experience on their socials (especially Instagram). In doing so, the visitors create word-of-mouth marketing. These exhibits are a great example of the art of the experiential – creating spaces geared toward online aesthetics and I.R.L. (in real life) consumption. One example is Maryellis Bunn’s and Manish Vora’s Museum of Ice Cream (an acronym for “Movement of Imagination and Creativity). When you go through the Museum of Ice Cream, you can’t help but immerse yourself in candy-coated dreams and enjoy a fruity popsicle next to giant lollipop replicas coming out of the ground in the hues of pinks, orange, and yellows. It is clear they are activating on their goal to unite and inspire the world through imagination — wrapped within a highly creative experience. The Museum of Ice Cream and others alike are finding permanent homes in some of the nation’s largest cities as the draw is huge and consistent. 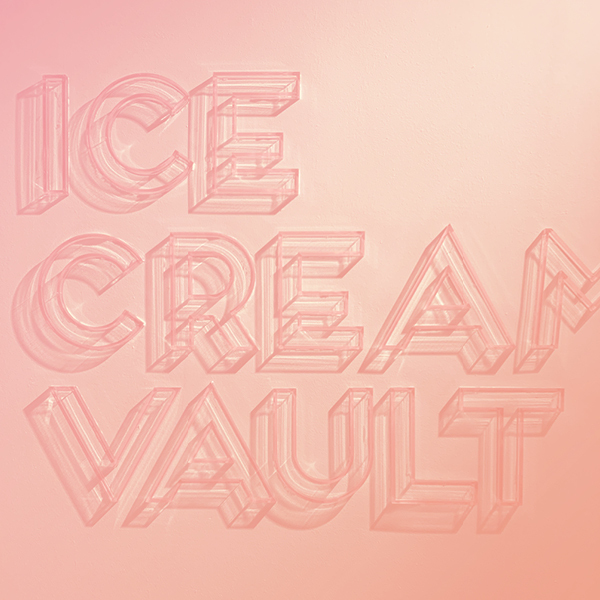 Content creates experiences at a place such as the Museum of Ice Cream, founded by Maryellis Bunn (founder/CEO) and Manish Vora (co-founder/president). Various forms of content converge to form an experience that evokes the joy of sweet treats, such as throwback music and the lollipop replicas. Within the Museum of Ice Cream, there is a feature in which you can suggest names for their next ice cream flavor. 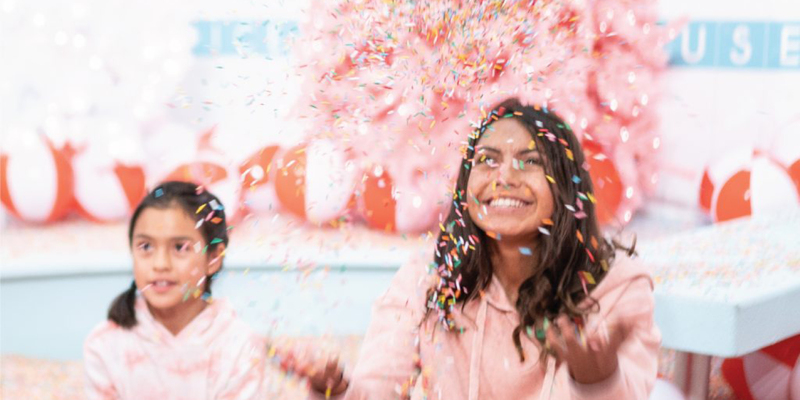 At this moment you realize that this museum is a brand-building effort for the Museum of Ice Cream to bring awareness and exposure to their brand of ice cream (available at Target), children’s apparel, toys, and dish and partyware. Here is a brilliant way to promote, in effect, a lifestyle brand and consumer products within a joyful experience. The experiences create content, too. Visitors cannot resist taking out their phones and share their ultimate Instagram photo opportunity. Contrast this approach with museums that prohibit photography, which is out of step with how people want to share experiences on social media. 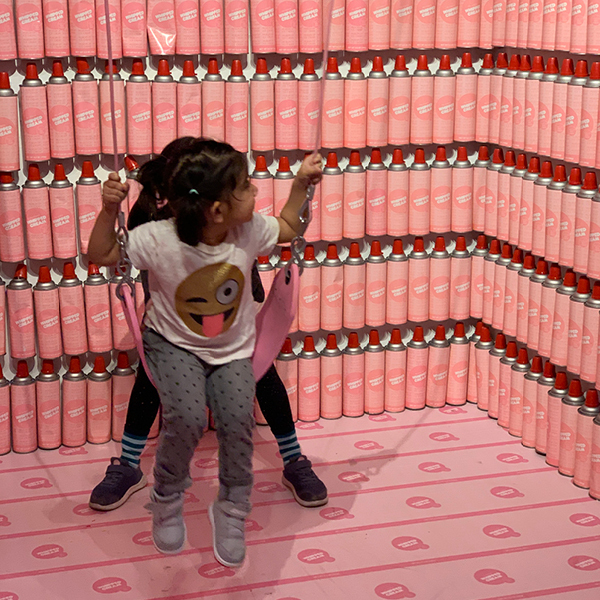 The experience design of the Museum of Ice Cream encourages visitors to pull out their mobile phones to capture and share lovable moments on their socials (especially Instagram) even though the founders say they did not design the experience for this purpose. The experience achieves scale. They bring scale to each exhibit by creating visual backdrops worthy of that perfect post. 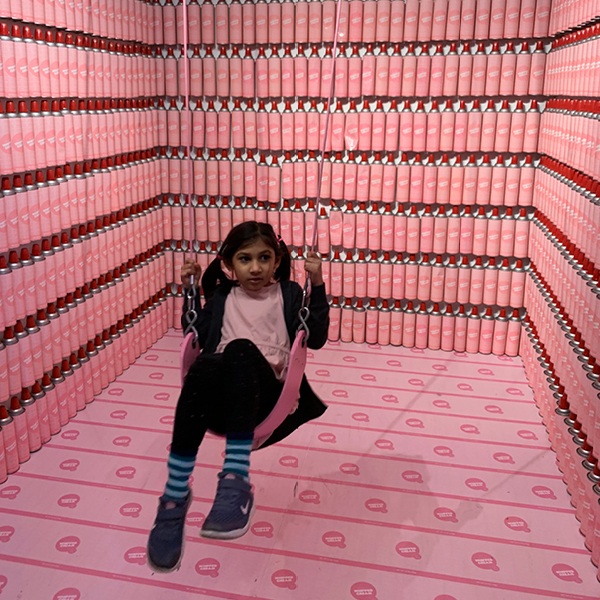 The exhibits can take the form of 500 cans of unlabeled whip cream stacked floor to ceiling across three walls with only a swing for you to use; positioning you to be the center of what seems like a diorama. Ever tried something like this before? Probably not. Sound intriguing? Yes! On the other hand, in the sprinkle pool, visitors encounter a space filled with what seems like one billon sprinkles nestled within a vintage pool room paired with a lifeguard teaching you yoga before you prepare to take a dip. Scale matters in an experience such as these. Why take a picture in front of one whip cream can when you can with 500? All your senses are activated. 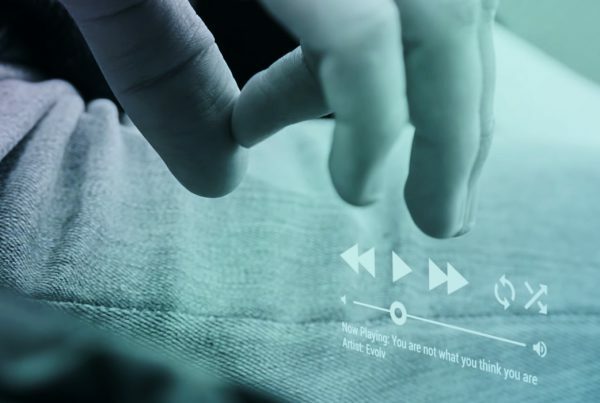 As I discussed in a previous post, designers of the future need to do be prepared to design for the senses. These exhibits are a great example. They bring taste, touch, sight, smell, and sound together to form an own-able moment. 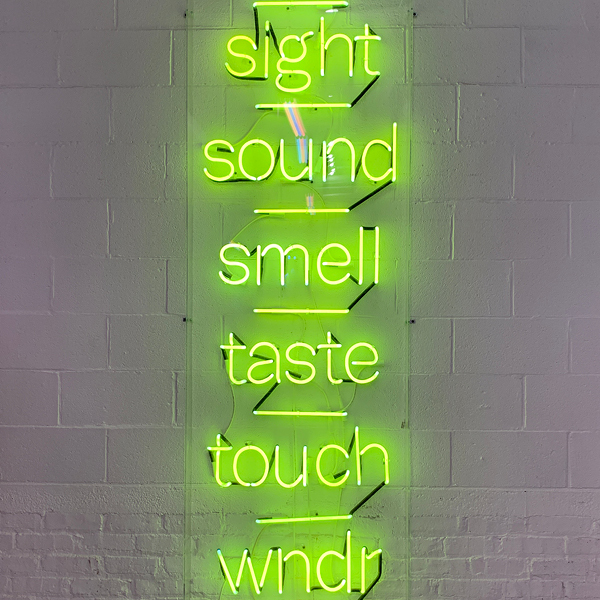 At the Museum of Ice Cream, I enjoyed a multi-sensory experience consisting of listening to R&B hits of the ‘90s while tasting locally sourced iced fruit popsicles amid a larger-than-life art installation of gummy bears and lollipops reminding me of a scene from a Katy Perry music video. In this moment, was the experience, and the experience was the content. You are a part of the art. Younger consumers crave to be at the center of attention and justifiably so: they grew up in an Instagram world. The Museum of Ice Cream puts you in the center of the art piece. A statue of a single unicorn in a gold room isn’t complete until you hop on it and take a picture. The sprinkle pool is pretty mundane until you have about 15 or so folks tossing beach balls and sprinkles up in the air. What a better souvenir from your trip than an Instagram story or post that earns multiple hearts from your favorite followers, who are living vicariously through your experience? You experience immersion and interaction. Each of these exhibits transport you and grab your attention at every corner. It is easy to forget what type of building you are in and in what city for that one and half hours. Unlike traditional museums, experiential exhibits are based on a backbone of interactivity inviting you to share moments with others devoid of any devices, whether you are jumping in a room filled with yellow balls or playing a pink jukebox while tasting pink soft-serve ice cream in a pink diner setting. You don’t watch. You experience as you step in and touch. Experiential exhibits achieve something else: they prepare us for a future in which immersive reality defines the offline experience. In fact, some traditional museums are incorporating immersive reality outright, as my colleague Mike Edmonds discussed in a recent blog post. There are no headsets to wear in Museum of Ice Cream yet. But they are preparing its audience for an immersive world that captures our senses, transports us beyond the built environment, and allows to interact with things and each other never imagined and at scale. Of course, businesses in retail and entertainment are among many that are trying to build immersive reality into their customer experience. What is stopping a struggling brand like the Gap – known for denimwear — from hosting and managing its own experiential “denim exhibit”? At Moonshot, we’re helping clients define and execute these immersive experiences that extend their brands and improve their businesses. 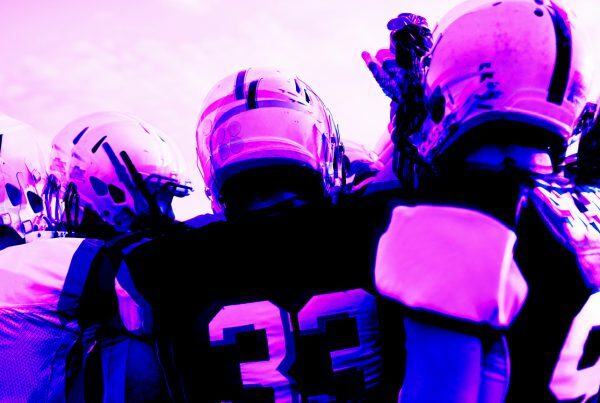 We draw from inspiration everywhere (including experiences such as mine) and use tools such as design sprints to help clients design lovable products and experiences centered on customers. To learn more, contact Moonshot.